Take the uncertainty out of the export packaging process by enlisting the help of Industrial & Wholesale Lumber. We’ll assist with the design and manufacturing of your crates, pallets or skids and give you peace-of-mind that your products will arrive in perfect condition wherever their destination. By determining the method of transport your products will experience, we can ensure adequate protection for your products. Whether shipping via air, road, rail or sea travel helps determine whether a plywood box, heavy-duty crate or disposable / reusable pack should be utilized. Contact your IWL representative today for more information. 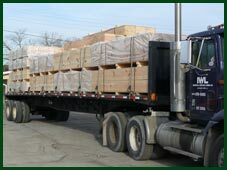 Our Mill facility in Schiller Park, IL is one of the largest in the Chicagoland area, allowing us to offer custom cutting of lumber and panel products to meet your specifications. Call your IWL representative for more details about our custom cutting capabilities. It’s important to us to help our customers be as productive as possible. We review business objectives and offer optimal solutions to inventory management. Through our vendor managed inventory and stocking programs, we’re able to suggest ideal scenarios that result in reduced inventory and just in time (JIT) deliveries that maximize your manufacturing floor space. Talk with your IWL representative today for more details. 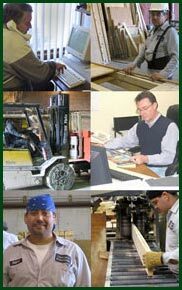 We take the guesswork out of the export packaging process. Industrial & Wholesale Lumber is a member in good standing with Timber Products Inspection’s Heat-Treatment Program which is accredited by the American Lumber Standard Committee, Inc. (ASLC). Our facility is in compliance with the International Plant Protection Committee’s ISPM 15; Guidelines for Regulating Wood Packaging Material in International Trade. This enables IWL to produce and stamp lumber, crates, pallets, and skids for export shipments to any port in the world. Please visit our Export Certified page for more information. With a fleet of trucks ranging from small pick-up trucks and large flat-beds, to even larger tractor-trailer trucks, you can always be assured of product delivered on-time, as promised, packaged to your specific requirements. We are located east of O’Hare International Airport with easy access to all major east/west, north/south expressways. Because of our convenient location, many of our customers who have trucks in the area will often opt to pick-up their material.